Description: An underworld criminal name JK is involved in terrorism as well as criminal activities, he also intervene in government affairs and is a crook in the book. When an honest police inspector Srivastav attempts to expose JK he is framed and evidences are tampered with so he is unable to prove his innocence, an as a result he commit suicide by hanging himself leaving his wife and son behind. Years later his son grows up an become a police inspector like his dad; inspector Vijay Kumar Srivastav; but is very much different from his dad by turning a blind eye to criminal activities, never serious with his job and accept huge sums of money to let off petty crooks. 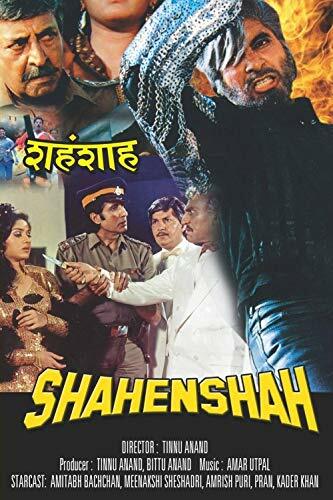 The talk of the town is a man in black clothing who calls himself "Shahenshah"; he operates as a Judge in the night, giving a verdict against his victims and killing them in a Executioner style. It looks like this man will get his hands on JK before the police does and might as well ruin the image of corrupt police inspector like Vijay Kumar Srivastav.An underworld criminal name JK is involved in terrorism as well as criminal activities, he also intervene in government affairs and is a crook in the book. When an honest police inspector Srivastav attempts to expose JK he is framed and evidences are tampered with so he is unable to prove his innocence, an as a result he commit suicide by hanging himself leaving his wife and son behind. Years later his son grows up an become a police inspector like his dad; inspector Vijay Kumar Srivastav; but is very much different from his dad by turning a blind eye to criminal activities, never serious with his job and accept huge sums of money to let off petty crooks. The talk of the town is a man in black clothing who calls himself "Shahenshah"; he operates as a Judge in the night, giving a verdict against his victims and killing them in a Executioner style. It looks like this man will get his hands on JK before the police does and might as well ruin the image of corrupt police inspector like Vijay Kumar Srivastav.